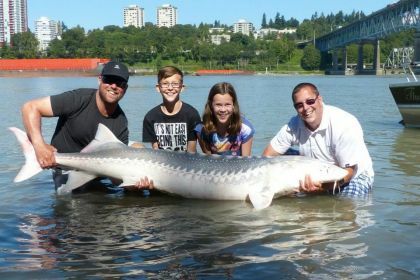 Sturgeon fishing is a must do for anyone living in or visiting Vancouver! Fraser River white sturgeon are the largest freshwater game fish in North America. Vancouver is fortunate to have world class sturgeon fishing right on its doorstep in the Lower Fraser River. Sturgeon are known for their sheer power, amazing acrobatics, and their impressive size. These massive fish are sure to put a huge smile on the most seasoned or novice anglers face. Fish in the 50 to 100 pound range are common and landing fish in the 200 plus pound range are a daily possibility. Our trophy white sturgeon fishery in the Fraser River is 100% catch and release. The reason why we have a world class sturgeon fishery in our backyard is due to management strategies like catch and release. If you are looking to take fish home we can set up a salmon/sturgeon combination. Doing a couple days of ocean salmon fishing and a couple days of Fraser River sturgeon fishing is a great way to experience two of our best local fisheries. Our Lower Fraser River sturgeon fishing are easy to access from Downtown Vancouver as it is only 20 to 30 minutes travel time to the boat launch. 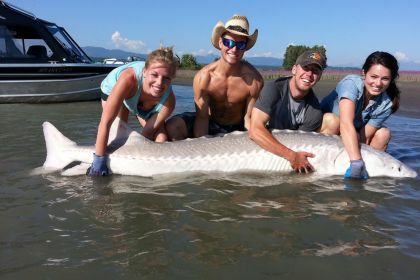 We also offer sturgeon trips out of Mission, a little further up the Fraser River.